I grew up on the east side of Los Angeles, in a town called Montebello, a pretty cool place to grow up. It was primarily a middle-class town, filled with working class people. There were attorneys, carpenters, carpet people, clerks, clergy, doctors, drapery people (my dad was one of the latter) dry cleaners, druggists, electricians, garage door installers, garbage men, jewelry stores, mechanics, machinists, radiator repair people, painters, pet stores, plumbers, restaurant owners and staff, sandwich shops, secretaries, teachers, and a whole lot of other important people. There were some people who had more, some had less, but there was not the discrepancy extreme wealth or poverty that we see today. 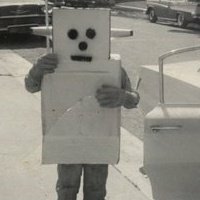 Portrait of the blogger as a young robot. One of the coolest attributes of the town, and neighboring towns are the attributes that truly made, and make America great. There were people from all over the world- immigrants and first and second generation born. My people, the Jews (both Ashkenazic and Sephardic), Mexican (and one family of Mexican Jews), Chinese, Japanese, Armenians, Russians, Lebanese, WASPs, and all sorts of others. Alas, there were no African-Americans that I knew of. Not sure why, but that is the way that it was. Even though there were some tensions amongst some of the groups, it was more personal rather than ethnic based. We went to school, played, and celebrated with each other. And we helped each other out, such as during the Jewish New Year, when we Jews would spend the days in the Synagogue. We all received notes from our Rabbi, excusing us from school, and we always took some extra notes to give to our non-Jewish friends who wanted to ditch. It was always funny to see them in line at the admin office, trying to explain that they were in synagogue too! For many years, I wondered why that all worked. I traveled a bit, lived in Israel, then Santa Cruz and San Francisco, which had even larger, and more diverse communities. And there was more division. It wasn’t until 1988, when I returned to Israel as an artist-in-residence at the northern town of Ma’alot-Tarshiha. There, I led collaborative art workshops with 4-6 graders in three neighboring towns- Jewish, Moslem and Christian. 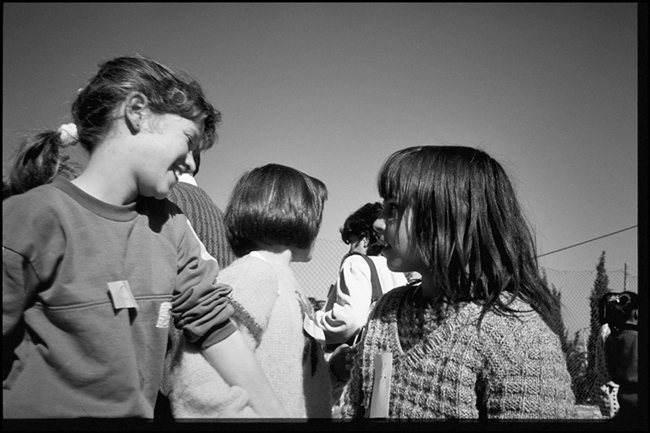 Each week, all of the students would meet at the school in one of the towns. We all played learn-each-others-names games, toured the town, visiting homes and places of worship, before returning to the school to work on collaborative art projects where the students would start a painting, and then pass it on to a neighbor to continue work. This way, each artwork was touched by members of each community. One of the amazing things that happened was the sudden awareness of each communities’ similarities: the kids rooms all looked alike, with the same celebrity posters on the walls (singers for girls, sports stars for boys); the hospitality of the host families, and the food and sweets that they served us, and even the basic tenets of the four faiths (there were a few Druze kids with us), especially the golden rule and treating each other with respect and loving kindness. What made this so interesting is that these three towns were all within an 8-kilometer radius, close enough to walk to. Although there was some interaction amongst the parents, for the most part, they all lived apart and never stepped foot in each other’s towns, except for those three visits. Upon reflecting on my experiences growing up in East L.A., my work in Maalot, and the current state of affairs in the world, I came to the obvious conclusion that what was special about growing up in Montebello was that despite some tensions, there was little to no fear of the others. We grew up, learned, fought, kissed and pretty much accepted each other. This was pretty much missing in the three towns near Ma’alot. Despite the proximity, very few ventured into the towns of the others. That is until art brought them together. Now we have “leaders” playing the fear, hate and paranoia cards, instead of preaching acceptance of the other. Happily, there are exceptions, but there is so much more work to do. One action that is necessary is with our language- branding others as the enemy, or lesser people does no good to anyone. Many of us know that, but not all. I am always bothered by the right-wing members of the Jewish community who insist on calling all Palestinians “terrorists”. One response that I have is to ask these people if they have ever really met any Palestinians for a conversation, or sat for coffee in their homes. Sadly, the answer is usually no. The hate is based on fear and ignorance. How do we change this? How do we teach that we do not need to fear the other- they are more similar then we realize and accept. There are lot of ways to do that- religious and social functions, cultural activities, schools, and so many more activities. And of course, how can I write a blog without mentioning comics and graphic novels! The number of books and stories about cultures, personal experiences, history and more is expanding daily. Comics and graphic novels are relatively inexpensive, promote knowledge, and literacy, which plants seeds of understanding and acceptance. The fruits of these trees will not be ready and ripe for several seasons, but nurturing them daily brings us closer to better lives for us all. Yeah, I know, I am an optimist, perhaps a blind one, but it is far better to be on this road than not. Also, I apologize for missing last week. I had a very sick computer. Actually, it still is sick, but a good friend lent me an extra of his. Thanks Rick! That was the gist of question that a friend asked me this week. A meandering conversation at a cafe led to me THE question: What’t the connection between my professional activities as an educational technologist, and my dissertation about teaching about social justice in schools using graphic literature. the branch of knowledge that deals with the creation and use of technical means and theirinterrelation with life, society, and the environment, drawing upon such subjects asindustrial arts, engineering, applied science, and pure science. What an interesting and cool word! And no mention of “digital”. So I suppose that this is probably the first connection- digital and analog are both tools and ways that can be used separately or together to teach and tell stories. Graphic literature and comics are great tools for learning: they are excellent ways to engage visual thinkers, as well as other types of learners in visual literacy and critical thinking. Comics and graphic literature can be used to teach languages, customs, medicine, philosophy, math, art, just about anything. The beauty and power of them is that they are a great medium to reach out across disciplines to provide and share basic understandings of each discipline. For example: there is a Manga introduction to statistics; a graphic pocket book series about major philosophers (I have Introduction to Nietzsche); an more recent and really interesting genre called graphic medicine; comics are used to teach ESL or any language. I’m sure that you get the drift. Comics and graphic literature are another great technology that teachers can use. Now where does that digital technology part come in? Simple- in production and distribution. There are all sorts of really cool tools and apps on mobile phones and computers to make all sorts of different styles of comics. Some cost (not much), some are free and there are ways to mix and match tools and processes from one device to another. But that, dear reader is for next week! I just finished watching Kurosawa’s Red Beard, one of my three all-time favorite movies (the other two are still out to vote, but one is by Chaplin and the other by Tati). I’ve seen this great film a bunch of times, usually through one complete viewing at a time. But this time, I decided to savor it, and watch it over a period of two months. Red Beard is truly a masterpiece. The story, acting, cinematography- everything together create a compelling, engaging, beautiful film that celebrates the best aspects of the human spirit living in a far from perfect world. I love to tell people that I wrote my doctoral dissertation on graphic novels and comics! But I am not the first to do this (for example, Nick Sousanis wrote his brilliant graphic novel, Unflattening, a meditation on the relationship between text and as his PhD dissertation. I took a a different approach and investigated and wrote about ways that graphic novels can be used to teach students about social justice. Yet, there is more to comics than philosophy, history and cognitive development. Studying graphic literature, specifically how to create comics provides many doorways to practical careers. The first, and most obvious is it teaches students how to make their own comics. Like other forms of art and literature, there is no guarantee to success. But, it is important to know that over the past 20-30 years, there is a steady increase in comic sales. Graphic literature is cheaper than making a movie, and easier to distribute than books (especially because of the web). Storyboard artists for movies and TV. creating corporate and academic presentations. Walkthroughs for large properties, amusement parks, architectural models, etc. Other activities requiring planning for movement. Graphic literature, especially comics are excellent media for creating training media for time and sequence based activities . This media is also very effective for building learning material for visual learners. Comics are excellent for teaching language (teachers can create their own learning materials based on the specific needs of their students). Graphic journalism to record events and reflections. Graphic medicine for medical students, practices and providing knowledge to different communities. Using graphic literature and comics is similar to using other media (film, tv, radio, etc) for learning and training, but it is more intimate than a film (cheaper to produce too), easier to customize for different languages and audiences and other benefits. All that is required is an imagination, and a desire to teach. Graphic literature as a gateway drug …. One of the coolest attributes of graphic literature in education is that it’s fun!. There, I said it- graphic literature is fun. Even the harshest books about war, racism and other evils of humankind have a basic quality of fun, similar to sitting with family and friends in a kitchen or around a campfire, sharing stories, good and bad, but very real. These are the kinds of stories that engage the listeners, capture their imagination, open their minds, educate and entertain. These stories capture and transmit the histories, observations, culture, and even recipes found in oral traditions everywhere, all the while promoting and encouraging literacy, and visual thinking. One of my research subjects, a high school teacher in a very low income area described how he has his students read anything at all for the first 30 minutes of his class, every day. Besides the books in his classroom, he also has several boxes of comic comics from his own collection (and brought in several boxes for the school library. He observed that even with books, most of the students read comics. They will read the first books of a series, get hooked, and read as many books of the series that are in the classroom. When they get to the point where the series continues, but the books are not in the classroom, they want more, so they trek to the library to continue reading the series. For many of the students, this is the first time in their lives that they have entered a library. So while improving their reading skills, they are introduced to books, and often transition to those (while continuing their love for comics). So as you see, comics are a gateway drug to literacy, and all that comes with it, such as critical thinking, creativity, and more! Next week- practical skills acquired from graphic literature, as well as comments about some books recently read. When used in school, students begin reading graphic novels during independent reading time in class, take them home to read, and trade volumes with their friends at school. These interactions serve as a basis for instructional conversations about the nature of comics and graphic novels, including the form, or visual/artistic style of the illustrations (e.g., drawings or photographs, black and white or color, realistic or cartoon), as well as the content/genre (e.g., personal narrative, fantasy, historical fiction, biography) of the various texts. Teachers and even librarians, support students by helping them envision and plan how their own graphic stories would take shape, support such discussions. Sones characterized graphic novels as “vehicles with which heir own graphic stories of the school in the improvement of reading, language development, or acquisition of information” (Sones as cited by Conners, 2010, p. 67) and it is possible “to build on students interests’ and use comic books constructively as stepping stones to a lasting interest in good literature” (Sones as cited by Conners, 2010, p. 66). Additionally, student authors can use graphic novels for studying a wide range of topics, including: journalism, history, sociology, literature, the arts and more. These novels are not replacement of traditional text, but a different way to reach out to a wider variety of learners, such as visual thinkers. Through the interconnection of text and images, and sequential or non- linear stories, graphic novels promote critical thinking. The results are stories well suited for the visual learner with rich, detailed images as well as engaging narratives, for all people to understand, enjoy and learn from. After taking an extended hiatus from writing, I am back at the blog. I’ve actually been thinking about this for the past couple of months or so, but truthfully, I was unsure of the direction to take, but kind of like being in a fog that has begun to clear, and a revisiting of the tag line, I will continue to write about life, learning and comics, or more specifically, graphic literature, a great term that I saw on a sign at Sky Light Books in Los Feliz. It seems to me that the term “graphic novels” is more suited to the many great fiction titles such as Watchmen. But many of the great titles are personal memoirs and histories, as well as world histories, such as Marjane Satrapi’s Persepolis, or Joe Sacco’s The Great War. Graphic novels also do not address other sub-genre of graphic literature, such as Graphic Journalism such as the brilliant work of Joe Sacco (Palestine, and Journalism), and a new favorite, Sarah Glidden (How to Understand Israel in 60 Days or Less and Rolling Blackouts: Dispatches from Turkey, Syria, and Iraq). Other interesting sub-genre are Graphic Medicine, and books about graphic literature, that are as much philosophical as aesthetic, such as Nick Sousanis’ brilliant Unflattening, a commentary on the relationship between text and line, or Scott McCloud’s Understanding Comics, as well as his other works. There is so much more too, but that shall have to wait, because I only have a couple of minutes to post this before midnight. Why you may ask? Because View from a blog will continue as a weekly blog, posted every Sunday by 10:00 pm, although from time to time, I may take the liberty to do an update during the week – artistic license. Comics, comix, graphic novels or graphic literature? When I started my dissertation research, I was surprised by the many names used to describe sequential pictorial stories- comics, comix, and graphic novels. Each name is good, and very specific sub-genre, but none really captured the essence of the genre. For example, in general comics and comic books represent the most traditional form- serials designed in a specific comic style filled with super heroes, talking animals, and several other recognizable characters. On the other hand, comix often are edgier in both art and stories, and are often counter-culture. Graphic novels fall into two categories- one is serial comics with extended stories and complex narratives, and the other, often recognized as graphic novels are often one volume, with more complex narratives that are often personal memoirs, and stories about history, events, and/or society. These are, of course, very general descriptions, and can be argued for one way or the other, but work very well for the purpose of this blog. Up to now, these titles represent the general categories. Of course there are differences among fans, creators and scholars. For example, there is a an art professor in one art school who states that all pictorial narratives are comics- from the cave paintings in southern France and northern Spain, to Australian Aboriginal paintings, to the Mona Lisa and artists like Van Gough. In a way, he is correct in that these are all image based narrative art. Yet, something about this just does not feel complete. In reflecting on this, I remembered something that I learned a while back, when studying art at UCSC, which is the word “intentionality”. I had an amazing teacher (actually, I had several amazing teachers), who would drill me on the intention of my work. She would quiz me on the meaning as well as what I was doing. Was it a formal, meaning was it exploring some of the formal issues of painting, such as composition, or color, or light and shade? Was it illustrative- telling a story by capturing a moment in time? Identifying and defining the intent is one of critical elements of painting and of art. This is why the notion of defining the cave paintings at Lascaux, the Mona Lisa, Monet’s Water Lilies, or Pollack’s action paintings as “comics” seems to fall short. I somehow think that the artists at Lascaux could have predicted comics, or the Abstract Expressionists of the 50s and 60s would be making comics, especially considering that at that time, comics were generally looked at as base, and without any merit, save for entertaining teen-age boys. I am thankful that this art form developed to the point of acceptance that it is a unique, and powerful media that can be used to express elaborate ideas and narratives, tell meaningful stories, have complex characters in rich relationships (or not), be fiction, or non-fiction, and can be presented in abstract or real ways for multiple audiences. In short, they are just like all other traditional text-based narratives, except that images are all critical components of the story. Which brings us back to this blog’s title, and what we should call this genre, what it the top-level descriptor. And I discovered the answer last week, when visiting this great bookstore in the Los Feliz neighborhood called Skylight Books. There, in their art and comics annex were two large bookcases filled with comics. One side was labeled “Serial Comics” and had titles published by Marvel, DC and other serial based comics. The label on the other bookcase is “Graphic Literature”, a term that really describes the genre, and includes serials, but really focuses on the unique, innovative, genre-buster stories that are often personal memoirs (such as Satrapi’s Persepolis, or Sacco’s Palestine), history, society, war (Spiegelman’s Maus or Uriarte’s The White Donkey) narratives that explore the medium, such as Nick Sousanis Unflattening, Scott McCloud’s Understanding Comics, or of any of the other genre-bending and/or personal reflections on life, and morality such as Will Eisner’s Contract with God. Graphic literature certainly describes many of my favorite stories, the ones that do not have talking animals (well, except for Maus, or Sfar’s The Rabbi’s cat), or super heroes (although the Monkey King does play an important role in Yang’s American Born Chinese). We can see clearly that the intent of the characters in these examples is different from Superman or Teenage Mutant Ninja Turtles. I think that it is important to remember that there is no judging here, only the recognition that there are different kinds of narratives and that they all fit under the rubric of Graphic Literature. Graphic novels are a great way to read and learn about history. Not so much the grand narratives in history books and textbooks. These books describe big events, and as described by Wikipedia “as the memory, discovery, collection, organization, presentation, and interpretation of information about these events.” When we read history, we read about large movements, both physically and metaphorically. We read about global wars, economics, great people who influenced and led these events and movements. But what I have always found missing in these books is the intimate- about the lives of the populous whose lives are affected by the decisions and philosophies of those who have achieved positions of leadership, of “power”. While learning about the grand events, intimate stories are missing. We read about mass migrations, global wars, the spread of disease and sickness, but only as abstractions, and these abstractions prevent us from learning about empathy- it is simply too difficult and challenging for an individual to feel empathic about the millions of victims of war and other historical horrors. This does not mean that we do not feel, or are not affected by reading about genocides- we do. But the level of abstraction creates a schism between the words and the reality, and unless we have personally experienced them, or know someone who has, they remain abstract. Some movies have explored some of the horrors of history, such as Steven Spielberg’s intensely powerful and deeply emotional film, Schindler’s list. But, unless you have experienced the Shoah directly, we are left with only the reflection. This is not a bad thing, as we have experienced too many genocides on this planet. But even when watching a movie that draws us into the story, and we become emotionally involved with the characters and the narrative, we also are aware of the general tension with the movie and our basic understanding that in the end, it is just a movie, with actors dressed in costumes, standing in movies sets, saying their lines, often out of order of other lines. We know that no matter how horrible and intense the narrative, each day the actors shower, and change clothes and go home or a hotel to relax and prepare for the next day’s shooting schedule. This knowledge does not mean that as viewers, we will not be emotionally and psychologically involved with the story. Simply put, it is good for our souls to remember that we are not seeing real. What this means when returning to the grand historical narratives that we read, is that again, we are left without a direct and authentic way of understanding the results of these grand events on humans on an intimate, human scale. Books about historical fiction, and memoirs can provide paths to understanding these grand events. Reading personal stories by people who have lived through and experienced some of the tragedies of life is both valuable and critical for people to understand the effects of grand events on large populations, by personalizing the effects of the events. But, they often leave out a place for the reader to learn and feel empathy. Just reading the words can remove the context of the story. The personal narratives the authors of many graphic novels, along with the merging of text, and images, provide a historical context for the personal. We read, we see, and we learn about the impact of broad historical events on individuals. We begin learn to feel empathy with others, who through no fault of their own, are made into victims, and hopefully, with this understanding, we can start to take the steps needed to initiate the changes that bring about social justice. And graphic novels are a great way to start. Some of the most powerful books that I have read, look at the effects of war and global trauma on children, describing their lives in and after war, about how they learned to survive unnatural situations by adapting a wide range of coping skills, from games of denial to active participation. No matter the method, the stories that these survivors are real, and compelling and challenge us to rethink our actions as well as the actions of some of our leaders. Another benefit of graphic novels as a media are that they are less expensive to produce and distribute than movies, or even books. They can be created using online tools and distributed using the web. By giving a voice to those with stories to tell, and spreading the word, perhaps people can learn about similarities between different cultures and communities around the world, and we can learn about the empathy that will guide change. Maus and Persepolis are two of the primary books that tell about results of war and conflict, but there are others that are memoirs of people who have directly experienced and survived and teach us through their own stories. Below is a short list of six of my favorite books. A game for swallows and I remember Beirut, both by Zeina Abirached are her memoirs about growing up directly on the border between the Christian and Moslem neighborhoods in Beirut during the time of the civil war. Although the war completely surrounded them, her two stories are more about how she, her family, friends and neighbors learned to cope with being in the middle of a war-zone, where gun-fire, bombs and explosions, food and power shortages were part of their daily regime. We become acquainted with Zeina, her family and neighbors and see how they manage their day to day lives, struggling to retain any sense of normalcy. The artwork is not detailed, but effective and engaging for the reader. War brothers: the graphic novel by Sharon E. McKay and Daniel LaFrance, is although not a personal memoir, is an extremely powerful story that is based on true accounts of Ugandan child soldiers that the authors gathered in hospitals and rehab centers for these children in Uganda. This is the story that nightmares are made of, as it covers the experience of the children watching their parents killed by Joseph Kony’s Lord’s Resistance Army, then being conscripted in the army and taught to kill, maim, and every and any other activity prohibited by the Geneva Convention. We are on our own is Miriam Katin’s memoir about her experience running away from the Nazis in Hungary with her mother. Katin, now a citizen of America and a respected graphic artist and animator, tells a compelling story of escape, but really focuses on issues of faith during a time when the horrors of the Holocaust caused people to challenge and question their faith and religious beliefs- then and now. She tells her story with artwork in both black and white (then) and color (now). A deeply personal and meaningful story. In Paracuellos, Carlos Giménez tells about his own experiences growing up in the orphanages of Francisco Franco’s Spain. These were not simply orphanages, as we might understand them, but more like the orphanage of Dicken’s Oliver Twist, but on steroids and managed by the uber-facist government of post-WWII Spain. Powerful is too weak a word to describe his experiences and those of all of the other survivors of these terrible church and government-run “orphanages”. Barefoot Gen, is a Japanese Manga by Keiji Nakazawa and his a memoir based upon his experiences as a survivor of the atomic bomb blast that destroyed Hiroshima. Told through the eyes of a young boy who saw and survived the blast, and saw its immediate results and affects on the civilian population, such as the shadows on the streets of vaporized people, the walking dead with their skins hanging off of their bodies. This book should be required reading for all students about the un-winnable, horrific nature of nuclear war. These six books, and many others expose students to the results of war on human beings, beyond the voices of politicians and historians, but from viewpoint of people who experienced and suffered from war first-hand, and on no desire of their own, but rather from people, “leaders”, far away from the real results of their policies. There are many other books, and please feel free to comment and tell me about them.